“We were given no choice but to leave,” said Nagham, who has just arrived in Jordan with her family after fleeing the Iraqi city of Mosul after Sunni Muslim extremists seized it. “We are people of peace and this is happening to us,” she said, speaking from the Melkite convent hall in Marka area where she is staying with 40 other refugees. Known as ‘Daesh’, ‘Islamic State’ or ‘Isis’, the armed men gave Christians like Nagham, her husband and two children a stark choice: either leave, convert to Islam, pay a heavy tax or be executed. Mosul was once home to 60,000 Christians. Such communities have lived there since the 2nd Century. 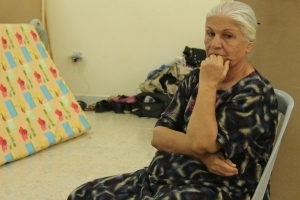 Since Iraq’s second largest city fell in June, all of them have left. Safwan and his wife Dalia Sabbah are expecting a new baby next month. “I keep just praying and in faith that God will help me,” she said. People fled with almost no belongings. What they did leave with was then seized at checkpoints. Those who fled Mosul have joined around one million other Christians, Yazidis and Shia Muslims who are on the run from the Islamic State’s blitzkrieg advance in the centre and north of the country. Many are in the Iraqi Kurdistan area. There Caritas organisations are working through Caritas Iraq and local parishes to deliver food, water, bedding and essential living supplies to them in Erbil, Dohuk and Zakho, irrespective of their religious, ethnic or political background. Meanwhile, Caritas Jordan is paying airfare from Erbil to Amman for 1000 Iraqi Christians this month. Then Caritas transports them to the local churches’ halls, schools and yards in 10 places across the country. Our Lady of Peace Centre is also one of the main places receiving Iraqi refugees and it now has around 80 people. Here you could meet Nadira, a 35 year old mother who escaped Iraq with her husband, Nashwan and three young girls. Nashwan was injured in his leg the day they had to leave since he was running trying to get his wife and daughters out of the house.